See the Media Gallery in this issue of eContact! for images and videos of Maria Chavez performing. The sound installations and live turntable performances of Maria Chavez focus on the paradox of time and the present moment, with many influences stemming from improvisation in contemporary art. She was awarded the Jerome Foundation’s Emerging Artist Grant by New York’s Roulette Intermedium in 2008, and in 2009 she became a recipient of the Van Lier Fellowship by The Edward and Sally Van Lier Fund of the New York Community Trust. Maria was an artist in residence with the Merce Cunningham Dance Company, the Clocktower and the Dia:Beacon Museum. She has worked with Christian Marclay and the Whitney Museum of American Art in NYC as part of Christian Marclay: FESTIVAL and has shared the stage with renowned artists such as Pauline Oliveros, Thurston Moore, Phill Niblock and Otomo Yoshihide. Besides other methods, you work a lot with broken or damaged needles, you call them “pencils of sound.” How and when did this approach and practice come about? This approach started when I was performing early on. I remember I was dragging a needle across a record and somehow the tip of the stylus got caught on a deep scratch and bent itself. But I had been dragging the needle across the record for a while so the stylus was warm, I think, and it twisted into a standing position and travelled across the vinyl on it’s own, like a ballet dancer. As the needle began to glide across the grooves of the record, it was still reading the sound that was cut into the vinyl. This situation opened the door to understanding how a needle breaks in certain situations. I encourage breaking but I don’t force the stylus to break. When one forces a needle to break it tends to break in the same way, clean off. But when one encourages the break by creating circumstances, that is when it morphs into other interesting needle configurations. This is why I refer to them as “pencils”: a pencil can break in different ways and can also wear itself down. I also tend to hold the needle arm like I hold a pencil in some of my techniques, hence the comparison. Maria Chavez performing inside Richard Serra’s outdoor sculpture Greenpoint at the University of Nebraska (Lincoln, Nebraska) on 30 May 2010. Photo © Jaime O’Bradovich. 2) How big is your collection of needles, is it a work in progress and under which criteria do you select the damaged needles? My needle collection normally contains between 3 and 5 styli. It is a work in progress as some needles wear down and tend to sound the same after a while. I have to keep things fresh by having a brand new, perfect needle around. As a needle starts to change, the sound opportunities expand for a little bit, then they snap into a certain sound characteristic. While I like using those needles, I won’t be able to use them as often, so my core stylus is the one in my collection that is the most intact. 1. 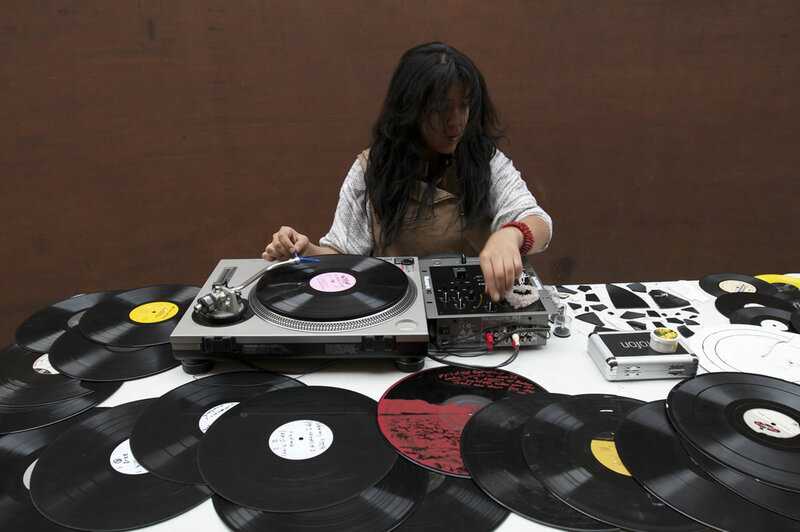 Maria Chavez was one of 16 performers at TITO — The International Turntable Orchestra, held at the Akademie der Künste in Berlin from 22–25 October 2009, produced by Zangi Music / Ignaz Schick. 3a) I noticed during TITO (1) that you have a very specific and unique sound. I was surprised how I could recognize you immediately from all the other players right after you just dropped the needle. Do you think that this is entirely up to the needles? I think the difference you are referring to is partly the needles’ characteristic, yes, but I also focus a lot of my attention on the topography of the vinyl and the tactile sensations between the needle and vinyl. Sometimes I feel as if I am trying to harness the sound by catching the vinyl with the needle. My solo work went through a phase where I was only working with 3 seconds of grooves in a record, which can translate into 3 grooves in the vinyl. This was important to me because I wanted to create a full sound work using very little surface area of the vinyl. Less is more, and I feel that this kind of focus and patience has become second nature for me, which makes the work sound unique, as you suggest. Thank you for saying that, by the way. Very nice of you. 3b) Have you conducted precise research into what kind defects and problem on the stylus lead to which kinds of malfunction or archetypes? I am writing a book right now about my turntable work which will include a section on my experience with styli. I’ve always wanted to make my own needles and work with Ortofone, which is the company I purchase all of my needles from (sponsor me!!). I haven’t spent time on researching the breaks, mainly because I’m too busy learning from them! I feel that I conduct a sensory research which is a human research, allowing chance to guide my experiments and memory to understand the changes. A broken needles life can be so short. One day you hear something interesting, then the next day it just sounds like all the other broken needles. It’s a fleeting fascination. Have you heard about this needle that is made out of jade and the stylus / cantilever is made out of a diamond? It costs like $8,000. I want to break it soooooo badly. 4) Have you consciously damaged or manipulated needles to achieve certain results, or is it rather more a random factor and findings within in your daily performance routine which leads you to some of the special ones? I think my answer above answers this question and yes, I have had some very special needles in my time. Mainly, my favourite needles are the ones that twist into themselves and still have the capacity to read the sound within the vinyl along with the physical attributes of the vinyl itself. 5) Do you notice a constant flux of your sound due to the changes in your collection? Like due to factors that make one needle which is irreplaceable unique, and when it finally breaks, this sound is gone forever? Do you try to conserve some of the needles or do you accept and welcome this constant flux? I welcome the flux. In the end, I don’t want to become dependent on these sounds. The piece is ultimately dependent on me and my choices along with the unique sounds that are available at that time. Letting go of a needle or special record can be a positive exercise, in my opinion. 6) Have you examined your “pencils of sound” under the microscope? I can pretty much tell what the stylus looks like by closely examining them. But I’m sure a microscope could be interesting if the stylus was bent in a certain way.